Trefoil Clampsare used for high voltage single core cables where the current rating is high and 3 core cables are not available. The Trefoil Clamps are used for laying single core cables in Trefoil touching formation which helps to maintain magnetic symmetry thereby avoiding electro magnetic heating and loss of current. It does nullify the induced magnetic field of high voltage power cable. The Trefoil ClampsareProtection ofpowerandcontrolcablefromthelightning dischargesand Establishment of easy cable circulation paths.Voltages are induced in the sheath of cables running in parallelwhich result in circulating currents flowing in the sheaths. The distances between single core cables running in parallel determine the voltages induced. With single core cables in trefoil formation (touching each other) the distances between the cables are minimum and thusthe voltages induced are minimized and hence the circulating currents. The circulating currents cause localized heating. We are in the business of Manufacturing high quality Trefoil Clamps conforming to most demanding standards to various industries since 1972. Trefoil Clamps are used for high voltage single core cables where the current rating is high and 3 core cables are not available. The Trefoil Clamps are used for laying single core cables in Trefoil touching formation which helps to maintain magnetic symmetry thereby avoiding electro magnetic heating and loss of current. It’s nullify the induced magnetic field of high voltage power cable. The Trefoil Clamps are Protection of power and control cable from the lightning discharges and Establishment of easy cable circulation paths. Trefoil Clamps are suitable for supporting Single Core PVC/ HRPVC, XLPE, XLPE Insulated Aluminum, Un- Armoured, Earth And Un Earth Power Cables from 1.1 Kv to 132 KV Grade. 3 Phase A.C. Circuits in trefoil formation in Generation Stations, Sub-Stations, Thermal Power Stations, Switchgear Plants , Industrial Installation, Terminal Kits, and Straight through Jointing Kits etc. These can be used for indoor or outdoor for vertical or horizontal running cables inside trenches or on racks / galleries. We are in the business of Manufacturing high quality Aluminium STRIP Trefoil Clamps conforming to most demanding standards to various industries since 1972. Aluminium Trefoil Clamps are used for high voltage single core cables where the current rating is high and 3 core cables are not available. The Trefoil Clamps are used for laying single core cables in Trefoil touching formation which helps to maintain magnetic symmetry thereby avoiding electro magnetic heating and loss of current. It’s nullify the induced magnetic field of high voltage power cable. The Aluminium Trefoil Clamps are Protection of power and control cable from the lightning discharges and Establishment of easy cable circulation paths. Aluminium Trefoil Clamps are suitable for supporting Single Core PVC/ HRPVC, XLPE, XLPE Insulated Aluminum, Un- Armoured, Earth And Un Earth Power Cables from 1.1 Kv to 132 KV Grade. 3 Phase A.C. Circuits in trefoil formation in Generation Stations, Sub-Stations, Thermal Power Stations, Switchgear Plants, Industrial Installation, Terminal Kits, and Straight through Jointing Kits etc. These can be used for indoor or outdoor for vertical or horizontal running cables inside trenches or on racks / galleries. We are in the business of Manufacturing high quality Nylon Clamps conforming to most demanding standards to various industries since 1972. Nylon Clamps are used for high voltage single core cables where the current rating is high and 3 core cables are not available. The Trefoil Clamps are used for laying single core cables in Trefoil touching formation which helps to maintain magnetic symmetry thereby avoiding electro magnetic heating and loss of current. It’s nullify the induced magnetic field of high voltage power cable. Nylon Clamps are suitable for supporting Single Core PVC/ HRPVC, XLPE, XLPE Insulated Aluminum, Un- Armoured, Earth And Un Earth Power Cables from 1.1 Kv to 132 KV Grade. 3 Phase A.C. Circuits in trefoil formation in Generation Stations, Sub-Stations, Thermal Power Stations, Switchgear Plants, Industrial Installation, Terminal Kits, and Straight through Jointing Kits etc. These can be used for indoor or outdoor for vertical or horizontal running cables inside trenches or on racks / galleries. By focusing on variegated demands of our respected clients spread all over the country, we are offering Single Cable Clamps. The offered cable clamps are designed by our practiced professionals at par with the market norms utilizing advanced techniques and best grade material. The offered cable clamps are checked on various parameters in order to assure its flawlessness. 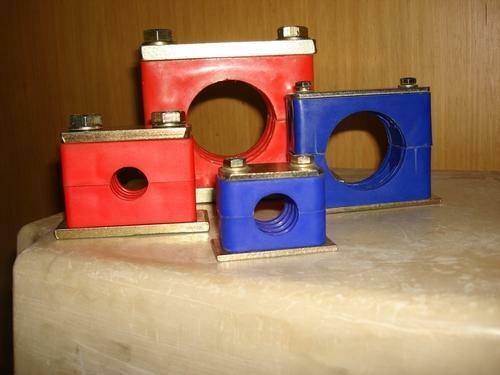 Our valuable patrons can avail these cable clamps from us at nominal prices. With the usage of advanced technology, we offer a broad assortment of Trefoil Clamp in FRP, Nylon, Aluminum . Helps in maintaining magnetic symmetry, so that we can avoid electromagnetic heating and loss of current, our offered trefoil clamps are manufactured by our competent professionals in our advance manufacturing unit. These trefoil clamps are examined by our quality controllers on various parameters. Electromac Industries manufactures premium quality Trefoil Clamps. These trefoil clamps are made from finest quality raw material to ensure international standards of quality blended with durability. Cast Aluminium Trefoil Clamps, provided by us, are useful in laying single core cables in trefoil touching formation that helps in maintaining magnetic symmetry. Our offered FRP Trefoil Clamp is widely appreciated by our customers, which are situated all round the nation. Furthermore, our company is widely renowned as one the prominent Trefoil Clamps Suppliers. Our organization has gained recognition as an affluent manufacturer and supplier of FRP Trefoil Clamp. Trefoil Clamps find usage in applications of high voltage single core cables where the current rating is high and 3 core cables are not available. Widely appreciated for laying single core cables, Trefoil helps in maintaining magnetic symmetry, thereby avoiding electro magnetic heating and loss of current. It nullifies the induced magnetic field of high voltage power cable. The Trefoil Clamps provides protection of power and control cables from the lightning discharges and establishing easy cable circulation paths. Sizes are depending upon the overall dimensions of the Cables, Normally trefoil clamps are used for single core cables. Backed by years of experience in this domain, we are involved in the manufacturing of meticulously Trefoil Clamp. These Trefoil Clamp are sturdy and easily adjustable. These Trefoil Clamps are manufactured by high quality cast iron and are durable in quality. These Trefoil Clamp find their usage on conductor cables. Developed using high quality raw material and latest technology as per the international standards, this clamp is available in different specifications to meet the application requirements of our clients. Moreover, this Trefoil Clamp is widely appreciated for its high durability and reliable functionality. We are one of the leading manufacturer and supplier of superior quality Trefoil Clamp. These are made of high grade Aluminium Alloy as per relevant IS specifications. Made by using high grade material, this range of Trefoil Clamp is widely appreciated by our clients. Known for its best quality, these Trefoil Clamp are available at most reasonable prices. Electromac Industries manufactures premium quality Trefoil Clamps. These trefoil clamps are made from finest quality raw material to ensure international standards of quality blended with durability. Cast Aluminium Trefoil Clamps, provided by us, are useful in laying single core cables in trefoil touching formation that helps in maintaining magnetic symmetry. Furthermore, our company is widely renowned as one the prominent Trefoil Clamps Suppliers. Our organization has gained recognition as an affluent manufacturer and supplier of Industrial Clamps. Developed using high quality raw material and latest technology as per the international standards, this clamp is available in different specifications to meet the application requirements of our clients. Moreover, this suspension clamp is widely appreciated for its high durability and reliable functionality. 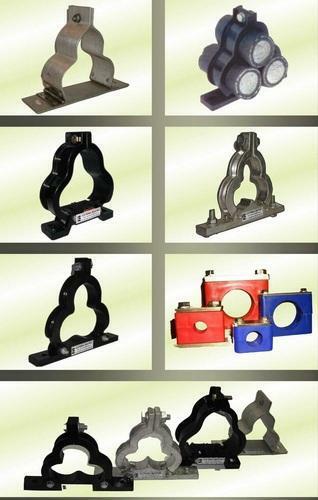 These Industrial Clamps demand in the market due to high quality and durability. These products are available in market at competitive rates. These Trefoil Clamps are used for high voltage single core cables where the current rating is high and 3 core cables are not available. These Aluminium Trefoil Clamps are used for laying single core cables in Trefoil touching formation which helps to maintain magnetic symmetry thereby avoiding electro magnetic heating and loss of current. It does nullify the induced magnetic field of high voltage power cable. We present a wide range of Clamps, that are precision designed to effectively meet the functional requirements of diverse industries. The clamps are made from quality tested materials as per the industrial requirements and are electrozinc plated. This product is manufactured by our experienced professionals using supreme grade raw material as per the international standards. We are involved in offering a wide range of Trefoil Clamp to our most valued clients. 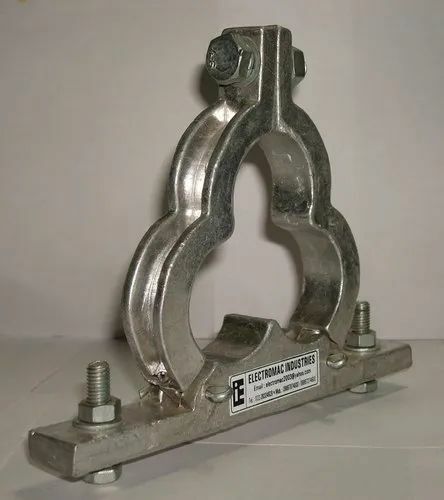 Developed using high quality raw material and latest technology as per the international standards, this clamp is available in different specifications to meet the application requirements of our clients. Moreover, this suspension clamp is widely appreciated for its high durability and reliable functionality. Our products are highly admired for their quality and reliability. We are engaged in providing a wide range of Trefoil Clamp. Our offered Trefoil Clamp is widely appreciated by our customers, which are situated all round the nation. These Aluminium Trefoil Clamps are used for laying single core cables in Trefoil touching formation which helps to maintain magnetic symmetry thereby avoiding electro magnetic heating and loss of current. It does nullify the induced magnetic field of high voltage power cable. These Trefoil Clamp are used for high voltage single core cables where the current rating is high and 3 core cables are not available. The Trefoil Clamps are used for laying single core cables in Trefoil touching formation which helps to maintain magnetic symmetry thereby avoiding electro magnetic heating and loss of current. These products are available in market at competitive rates. We are instrumental in manufacturing and supplying an excellent quality range of Trefoil Cable Cleats. These high performing cleats are widely used in various electrical appliances and accessory. These are designed from premium quality raw material and innovative technology as per the international quality standards. We offer our range of Trefoil Cable Cleats at most affordable prices. We are comprehensive range of Trefoil Cable Cleat that are widely used in cables for various ranges. Developed using high quality raw material and latest technology as per the international standards, this clamp is available in different specifications to meet the application requirements of our clients. Moreover, this suspension clamp is widely appreciated for its high durability and reliable functionality. These Trefoil Cable Cleat are used for laying single core cables in Trefoil touching formation which helps to maintain magnetic symmetry thereby avoiding electro magnetic heating and loss of current. It does nullify the induced magnetic field of high voltage power cable. We are engaged in manufacturing and supplying a wide range of Trefoil Cable Clamps that is preciously manufactured with the superb quality raw material. Our range is appreciated by the client for its long lasting features. These items are at par with the international quality standards and are available in variety of patterns and designs. We have emerged as the foremost manufacturer and supplier of Trefoil Cleat those are available as per the requirement of client. These Trefoil Cleat are widely appreciated by our clients which are situated all round the nation. High in demand, these Trefoil Cleats are available at most reasonable prices. These products are available in market at leading industrial rates. Our organization has gained recognition as an affluent manufacturer and supplier of FRP Trefoil Clamp. These Trefoil Clamps are used for laying single core cables in Trefoil touching formation which helps to maintain magnetic symmetry thereby avoiding electro magnetic heating and loss of current. Developed using high quality raw material and latest technology as per the international standards, this clamp is available in different specifications to meet the application requirements of our clients. Moreover, this suspension clamp is widely appreciated for its high durability and reliable functionality. We are comprehensive range of Trefoil Cable Cleat that are widely used in cables for various ranges.Trefoil clamps are used for keeping three single core cables in Trefoil arrangement which helps to maintain magnetic symmetry thereby to avoid current loss and the heating of electromagnetic. Trefoil Clamps are suitable for supporting Single Core PVC/ HRPVC, XLPE, XLPE Insulated Aluminum, Un- Armoured, Earth And Un Earth Power Cables from 1.1 Kv to 132 KV Grade. 3 Phase A.C. Circuits in trefoil formation are used in Generation Stations, Sub-Stations, Thermal Power Stations, Switchgear Plants, Industrial Installation, Terminal Kits, and Straight through Jointing Kits etc. These can be used for indoor or outdoor for vertical or horizontal running cables inside trenches or on racks / galleries. These FRP Nylon Trefoil Clamp are made from finest quality raw material to ensure international standards of quality blended with durability. Cast Aluminium Trefoil Clamps, provided by us, are useful in laying single core cables in trefoil touching formation that helps in maintaining magnetic symmetry. Furthermore, our company is widely renowned as one the prominent Trefoil Clamps Suppliers. Trefoil Clamps find usage in applications of high voltage single core cables where the current rating is high and 3 core cables are not available. Widely appreciated for laying single core cables, Trefoil helps in maintaining magnetic symmetry, thereby avoiding electro magnetic heating and loss of current. The Trefoil Clamps provides protection of power and control cables from the lightning discharges and establishing easy cable circulation paths. 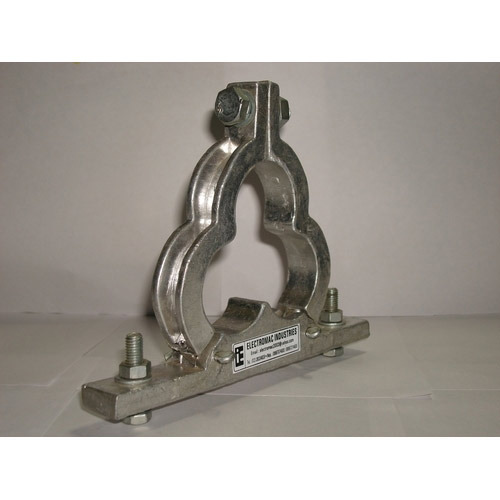 We are a noteworthy organization in the domain, engaged in providing superior quality Cast Aluminum Trefoil Clamp. These Cast Aluminum Trefoil Clamps are highly reliable as these are fabricated using optimum quality material. Available at market leading prices. Our Cast Aluminum Trefoil Clamps are highly durable and can also be customized as per the client's requirements and industrial demands. Backed by years of experience in this domain, we are involved in the manufacturing of meticulously Nylon 66 Trefoil Clamp. Nylon 66 Trefoil Clamp, are used for laying single core cables in Trefoil touching formation which helps to maintain magnetic symmetry thereby avoiding electro magnetic heating and loss of current. It does nullify the induced magnetic field of high voltage power cable. We are leading manufactures suppliers of Nylon 6 Trefoil Clamp used in electrical line cable or other projects and application wherever cable are used. 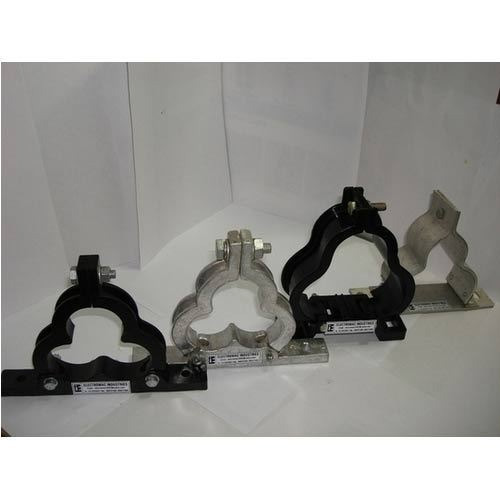 These Trefoil Clamp are good demand in the market due to high quality and durability. Our Nylon 6 Trefoil Clamp are highly appreciated for their quality and longer life. These are gettable at a very low market prices. We are offering our customers a wide range of Trefoil Clamps. Our offered Trefoil Clamps is widely appreciated by our customers, which are situated all round the nation. Known for its best quality, clients can avail this Trefoil Clamps at industry leading prices from us. These Aluminium Trefoil Clamps are used for laying single core cables in Trefoil touching formation which helps to maintain magnetic symmetry thereby avoiding electro magnetic heating and loss of current. It does nullify the induced magnetic field of high voltage power cable. We are in the business of Manufacturing high quality Aluminium Die Cast conforming to most demanding standards to various industries since 1972. Aluminium Die Cast are used for high voltage single core cables where the current rating is high and 3 core cables are not available. The Trefoil Clamps are used for laying single core cables in Trefoil touching formation which helps to maintain magnetic symmetry thereby avoiding electro magnetic heating and loss of current. It’s nullify the induced magnetic field of high voltage power cable. Aluminium Die Cast are suitable for supporting Single Core PVC/ HRPVC, XLPE, XLPE Insulated Aluminum, Un- Armoured, Earth And Un Earth Power Cables from 1.1 Kv to 132 KV Grade. 3 Phase A.C. Circuits in trefoil formation in Generation Stations, Sub-Stations, Thermal Power Stations, Switchgear Plants, Industrial Installation, Terminal Kits, and Straight through Jointing Kits etc.These can be used for indoor or outdoor for vertical or horizontal running cables inside trenches or on racks / galleries. We are comprehensive range of Aluminum Trefoil Cleats that are widely used in cables for various ranges. Trefoil clamps are used for keeping three single core cables in Trefoil arrangement which helps to maintain magnetic symmetry thereby to avoid current loss and the heating of electromagnetic. We are comprehensive range of Trefoil Cable Cleat that are widely used in cables for various ranges. Our offered Trefoil Clamps is widely appreciated by our customers, which are situated all round the nation. These Trefoil Clamp are good demand in the market due to high quality and durability. Our Trifoil Clamp are highly appreciated for their quality and longer life. These are gettable at a very low market prices. Trefoil clamps are used for keeping three single core cables in Trefoil arrangement which helps to maintain magnetic symmetry thereby to avoid current loss and the heating of electromagnetic. These trefoil clamps are made from finest quality raw material to ensure international standards of quality blended with durability. Molded Trefoil Clamps, offered by us, are extensively used in high voltage single core cables with high current rating. Cast Aluminium Trefoil Clamps, provided by us, are useful in laying single core cables in trefoil touching formation that helps in maintaining magnetic symmetry. Furthermore, our company is widely renowned as one the prominent Trefoil Clamps Suppliers. Looking for “Aluminum Trefoil Clamps Cleats”?